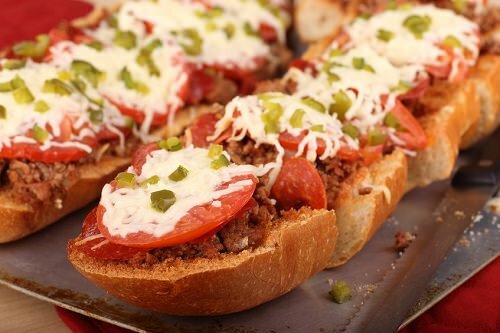 Though you can have pizza any time of year, you can make it heartier when you serve it on French bread. Cut your crusty bread loaf in half and coat each half with a thick layer of pizza sauce. Top with thickly sliced mushrooms, red and green bell peppers, crumbled Italian sausage, and mozzarella cheese. Bake in an oven set to 375 degrees for about 15 minutes.